The City Creek Trail System in Pocatello is on the west bench just south of Old Town. In less than 10 minutes you can go from the middle of town, to an outdoor oasis. The trail system runs between Cusick Creek and Trail Creek, and goes over the top of Kimport Peak. There are a variety of trails for ATV’s, horses, mountain biking, running, and hiking. On the City Creek trail map below there is a list of what activities are allowed on each trail. These trails range in difficulty from beginner to very difficult. 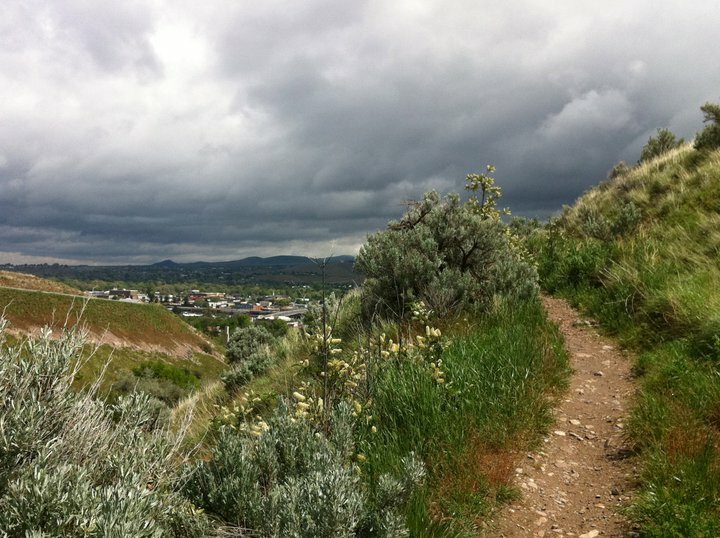 Whether you are an avid mountain biker going over the top, or a casual walker that just wants to get out of town for an hour, you will see why The City Creek Trail System is Pocatello’s hidden gem. Below you will find the local’s guide. Click on any of the highlighted trails for a short description of each trail, video, and a place to review or comment about the trail. Videos aren’t great quality so we are working to improve them. They are meant to give you an idea of what to expect from each trail. Some trails don’t have videos yet. Click on the City Creek trail map image for a full PDF map. with an average grade of 10%, max of 15%. grade from 15% to 20%. These trails have obstacles up to 15″ tall.